THE CENTRAL BANK was in the firing line of the Oireachtas Finance Committee today, described by one TD as “a dog that is refusing to bark, never mind bite” in relation to the tracker mortgage scandal. 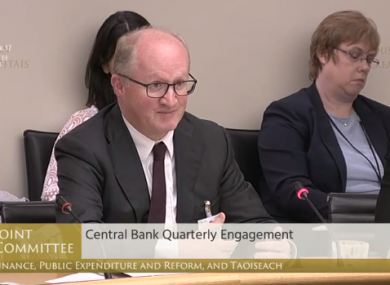 Central Bank Governor Philip Lane said 11 of the 15 institutions in this examination had been engaging in this activity, which saw banks either denying customers trackers when they were entitled to one, or charging them the wrong tracker rate. “I don’t believe all lenders happened to make the same mistake at the same time, ” Fianna Fáil’s Michael McGrath told him. He described this as “one of the greatest consumer rip-offs in our State’s history”. Figures supplied by the regulator earlier this week revealed 13,000 accounts were impacted by the scandal. Some 7,100 Permanent TSB and Springboard accounts had already been identified prior to this current examination, which puts the total now above 20,000. Lane said today he believes there are “substantial numbers” over this. In its latest update, the Central Bank said it had run into issues with the redress and compensation schemes proposed by the banks as they were not offering enough to customers they had caused harm to. In the case of two institutions, it also found “populations” of customers who it believes are impacted, but who have been told by their bank that they are not. These two lenders have been told to go back and look at those accounts again. Today Lane said the regulator has had to “repeatedly challenge” lenders to push them to identify and remedy the problem. He said this is why the process taken so long thus far. Legislation related to the powers of the Central Bank, which was introduced in August 2013, allows the regulator to compel lenders to pay redress to customers. However Lane said this is not retrospective and this is where issues have arisen in this case, as much of the damage in relation to tracker mortgages was done before 2013. He said the focus now is on persuading banks it is in everyone’s best interests for them to offer redress and compensation now, before going through other lengthy and expensive processes. This is working in some cases, but in others, the lenders are not budging. Derville Rowland, Director General of financial conduct at the Central Bank said in cases where customers are excluded from the current process, despite the regulator’s belief that they are in fact affected, lenders will be required to write to them. They will be compelled to inform these customers that while they were deemed not impacted, they can pursue the matter through the Financial Services Ombudsman or the courts. She said the regulator had seen the “devastation” this scandal had caused. However, she said it is restricted in what it can compel the banks to do. This was not good enough for many of the members of the committee, who questioned the executives about why they are extending deadlines for banks and not using powers they have to push them. Sinn Féin’s Pearse Doherty described them as “a dog that is refusing to bark, never mind bite”. Lane repeatedly told members that decisions in relation to redress and compensation are for the banks to make and pointed out that they were the ones who caused the damage. “You regulate the banks,” Senator Kieran O’Donnell reminded him. A number of members asked whether there had been collusion or ‘cartel’ behaviour between the banks. Lane said he did not believe this to be the case. He said there was a culture in the banks of using ambiguities in contracts and interpreting them “in favour of making their own profitability higher, to the detriment of customers”. The regulator confirmed it has met on two occasions with gardaí on the issue, but no formal report or complaint has been made. When asked by Solidarity TD Paul Murphy whether he believed things had changed, Lane replied that “we are far from a revolution in how the banks operate”. His colleague Derville Rowland was also asked whether any of these lenders had threatened legal action against the bank in relation to its examination. “Not formally she told them,” adding, when pushed; “There certainly was discussion about the [Central Bank's] powers.”. Yesterday the Taoiseach said bank bosses will be hauled in by Finance Minister Paschal Donohoe early next week to answer for the scandal. The Central Bank expects all lenders will have redress and compensation schemes in place by the end of this year, but it may be well into next year before many of the impacted customers see their money. Email “'A dog who won't bark, never mind bite': Central Bank in the firing line over tracker scandal”. Feedback on “'A dog who won't bark, never mind bite': Central Bank in the firing line over tracker scandal”.